4.1 The costovertebral complex is mandatory for respiratory movement of the chest wall. The skeletal makeup of the thorax includes the thoracic vertebrae, intervertebral discs, ribs, sternum and costal cartilages . The contents of the hollow thorax consist of the lungs, heart and thymus gland, as well as the beginning of the great systemic artery (aorta) and the end of the great systemic veins (superior and inferior vena cava). The costovertebral joint and costovertebral ligaments play a pivotal role in thoracic stabilization, load bearing, mobility, protection and chest wall movement, all while contributing heavily to respiratory effort. The thoracic architecture allows motion in all planes. In flexion-extension, the range of motion begins at four degrees at T1 and increases incrementally to 12 degrees at T12. Lateral twisting typically allows six to seven degrees per vertebral segment. Rotation occurs inversely to flexion. T1 rotates nine degrees and incrementally decreases to two degrees at T12. Rib-joint stiffness is greatest at T2 and weakest at T10 . The thoracic cage plays an important role in load-bearing, providing between 30-40% of thoracic spine stiffness. Additionally, the costovertebral complex serves as scaffolding for the musculature of the thoracic spine and shoulder. All of the above motions and loads cause stress to the costovertebral attachments at both the vertebral body and the transverse process. Fortunately, the strong costovertebral and costotransverse ligaments stabilize these joints and also add a degree of flexibility. The costovertebral complex is mandatory for respiratory movement of the chest wall. one is the caudal and cephalic movement of the diaphragm, which lengthens or shortens the chest cavity. The contraction of the diaphragm during inspiration generates a negative intrathoracic pressure, allowing for expansion of the lungs. During quiet breathing, the intrapleural pressure is about -2.5 mm Hg (relative to atmospheric pressure) at the start of inspiration and decreases to approximately -6 mm Hg. Thus, generating a slightly negative pressure gradient allows air to flow in. When the diaphragm relaxes, the elastic recoil of the lungs, abdominal structures and chest wall compresses the lungs, causing expiration. The airway pressure becomes slightly positive at that point, allowing air to flow out of the lungs. During quiet expiration, contraction of the inspiratory muscles in the early stages exerts a braking action on the recoil forces and delays expiration . Quiet breathing occurs primarily by diaphragmatic movement. Even bilateral paralysis of the diaphragm does not lead to hypoventilation as long as the thorax remains mobile and the thoracic muscles and costovertebral joints are functioning well. However, the diaphragm is instrumental in the event the intercostal muscles are paralyzed or the thorax becomes immobile . The second method for lung expansion is the elevation of the ribs, which increases the anteroposterior and transverse diameter of the chest cavity. In the normal resting position, ribs are slanted downward allowing the sternum to be situated posteriorly. When the ribs are elevated, they are projected laterally and anteriorly leading to an increased transverse and anteroposterior diameter. With an increased diameter, maximum inspiration can increase the intrathoracic volume by as much as 20% . The muscles of deep inspiration involved in raising the rib cage are the external intercostals, anterior serrati, scalene, sternocleidomastoid, levatores costarum and the serratus posterior superior . As these muscles contract, the ribs and sternum are elevated and projected outward. In a forced inspiration, the muscles of deep inspiration are utilized concurrently with the levator scapulae, trapezius and rhomboids to raise and fix the scapula. Additionally, the pectoral muscles and serratus anterior muscles also aid in elevating the ribs. Strong inspiration can reduce intrapleural pressure as low as -30 mm Hg . The muscles of forced expiration that pull the rib cage downward are the internal intercostals and the abdominal recti primarily, with minor contributions from the quadratus lumborum, subcostals, transverse thoracic and serratus posterior inferior The posterior costovertebral joints and the anterior costochondral joints assist in making the downward movement possible. The range of motion at any one of the thoracic joints is small, but the frequency of movement of these joints is extremely great. The second through the sixth ribs each move around two axes. Movement at the costovertebral joint in a side-to-side (gliding) axis results in the raising and lowering of the sternal end of a rib. This is referred to as the “pump-handle” movement. Because the ribs are sloped downward, any elevation (e.g., during deep inspiration) will result in an upward (cephalic) and forward (anterior) movement of the sternum, thus increasing the anteroposterior diameter of the thorax. The lower ribs move laterally when they are elevated, which consequently increases the transverse diameter of the thorax. This motion primarily occurs at the seventh through 10th costotransverse joints. Since the articular tubercle of the joints is flat, the ribs move up and down and allow what is referred to as the “bucket-handle” movement. The axis of rotation at the first rib is unique compared to the other ribs. There is minimal movement at the first rib during quiet breathing. A slight rotation about its neck causes a small amount of rising and lowering of the sternum, which can result in a minute change of the anteroposterior diameter of the thoracic inlet. The second through sixth ribs move in a similar axis to the seventh through 10th ribs. The costal cartilage deviates upwards on the second through sixth ribs, which causes a posterior movement of the sternum (the “pump handle” effect) during elevation . The length of the transverse process also has an effect on the costovertebral complex. As the length of the transverse process varies (with its concomitant costotransverse articular surface), the leverage that is exerted on the costovertebral joints varies as well . Movement a few millimeters anteriorly, cephalically or laterally of the thoracic wall can increase its volume by approximately one-half liter . The costovertebral complex is an essential component of the biomechanics of chest wall movement. The costovertebral ligaments make the actions of the costovertebral joints and intervertebral movement possible. These ligaments function to affix, stabilize and allow some motion of the ribs on the thoracic vertebra at the costovertebral joint. Their presence helps with the load-bearing, protection, posture and scaffolding roles that the thoracic cage provides with their stabilization properties . More so, they allow and limit movement of the ribs at the transverse joint to allow for maximum expansion of the thoracic cavity as needed for respiratory demand. Lastly, their actions on both the costovertebral and intervertebral complexes allow lateral bending and axial rotation. Innervation of the costovertebral ligaments is supplied by the lateral branch of the thoracic dorsal rami of C8 and T1 to T11 . The costovertebral joints receive this innervation in a segmental fashion with each joint receiving fibers from the level above and directly below it. Pain originating from the joints is well-localized and level specific . This seems to follow Hilton’s law, which states “that the innervation of a joint is the same innervation as the muscles which move the joint and the skin overlying the joint” . Mechanoreceptors have been identified in the region of the middle costotransverse ligament . This innervation is characteristic of neurons providing nociception and mechanoreceptor activity. Activation of these mechanoreceptors, either by mechanic loading or inflammation, may cause pain and reflex muscular hypertonus. Tachykinins (substance P and calcitonin gene-related peptide), neuropeptides activated in response to nociceptive stimulation, have been found aside costovertebral ligaments. Thus, it appears that known neuropeptides are present along the costovertebral ligaments that can activate pain and propagate an inflammatory cascade . Studies in rabbits have identified slowly adapting mechanoreceptors in the costovertebral complex that are capable of signaling the absolute rib position, direction and velocity of movement . These mechanoreceptors are also sensitive to tension and can alter the strain of the surrounding ligaments. There is a group of these receptors that is sensitive to caudal rib movement, known as “expiratory receptors,” and a group that is sensitive to rostral rib movement, or “inspiratory receptors” . There have been no similar studies in humans. Nonetheless, these findings provide a probable pathway to consider. In approximately 60% of individuals, there is a linkage of the brachial plexus to the first and/or second intercostal nerve, known as Kuntz’s nerve. Therefore, disorders affecting the first or second costovertebral joints can result in arm pain referred via this pathway . ↑ O’Rahilly R. Philadelphia: Saunders; 1986. Basic Human Anatomy. ↑ Ganong WF. San Francisco: Lange; 1977. Review of Medical Physiology. ↑ Guyton AC. Philadelphia: Saunders; 1986. Textbook of Medical Physiology. 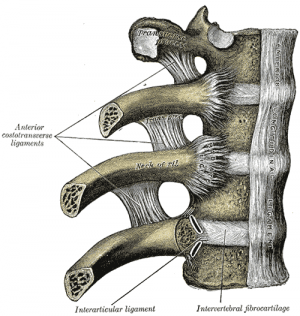 ↑ Thoracic spine: anatomical and biomechanical considerations for manual therapy. Edmonston SJ, Singer KP. Man Ther. 1997;2:132–143.